Sue Orfield (left) with Ellen Whyte. 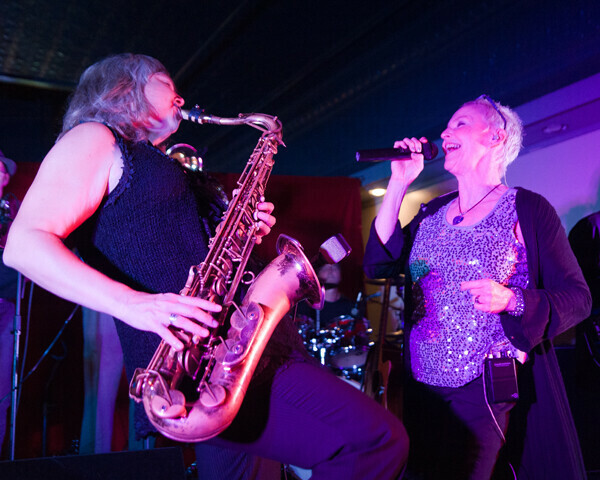 Every year we do this Best Of poll, local saxophonist Sue Orfield (either by herself or in one of her various bands) tops the Best Blues Band and Best Jazz Band categories, usually placing first or second – as she did this year, when she also ranked in the top 10 of the Best Rock Band category. But does she play blues? Does she play jazz? Or does she rock? Yes, yes, and yes. And no. By excelling in all of these genres (and others) while refusing to remain limited to any one style durning any one show, Orfield has saxed herself right out of our standard categories. She’s a local musical unicorn, people. Winner of last year’s coveted Best Sue Orfield award, she doesn’t seem to care about mundane musical concepts like “genre.” She plays. She entertains. And she’s always upping her game. Beyond her master dexterity on the saxophone and reputation for killer concerts, Orfield has used her unique talents to mix seamlessly with other performers. Through regular gigs and her Sue Orfield Show (on Chippewa Valley Community Television), she’s played with the likes of Michael Perry and the Long Beds, UWEC’s Jazz I Ensemble, blues crooner Ellen Whyte, and hard rockers The Jaggernauts. So this year, we’re very proud to award Most Outstanding Sue Orfield to none other than Sue Orfield.